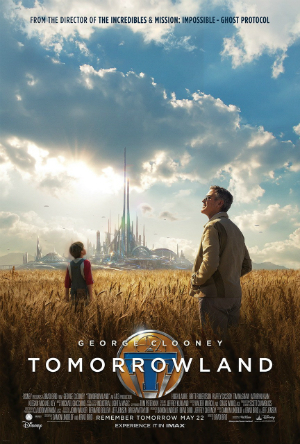 An adventure story for young people, Tomorrowland follows a plucky teenage heroine named Casey Newton as she attempts to save the world. It’s a family-friendly film, with a buoyant, optimistic emphasis on the possibilities of a future in which technology has been harnessed for the benefit of mankind. Yet it’s also serves up a moral lesson about mankind’s reluctance to change, even in the face of dire warnings about the end of human society as we know it. For much of its running time, Tomorrowland functions as a science-fiction mystery, with an opening featuring a grizzled George Clooney and an excitable Britt Robertson dithering over how to present the story. Clooney goes first, giving the origin of his character, Frank Walker, as a fantastically bright boy who heads to the 1964 World’s Fair in New York with his invention, a jet-pack that doesn’t quite work yet. While there, young Frank (Thomas Robinson) meets Athena (Raffey Cassidy), who looks to be his age, and she introduces him to a fantastically bright future, filled with geegaws that are very suggestive of a far more animated extension of Disneyland’s very own Tomorrowland theme park section in the 1960s. It’s much more a world based on fantasy than science, but it looks exactly like something dreamed up by a science-fiction loving kid would have dreamed up in the 1960s. The film then pauses, turning the stage over to Casey (Robertson). She’s revealed to be a fantastically bright young woman living in Florida. Her father (Tim McGraw) is a NASA scientist who’s about to lose his job because the nearby launch platform is shutting down. Her younger brother Nate (Pierce Gagnon) looks to be pretty smart, too, but it’s Casey who is trying in vain to delay the closing of the launch platform. During a legal entanglement, she discovers a mysterious pin among her possessions; touching the pin transports her to a magical world that looks much like the one that Frank first visited some 50 years before. Soon Casey meets up with Athena, and then with the grown-up Frank (Clooney), and the point of the story will become apparent, but until then it’s a grand, motion-filled ride, as the ever-optimistic Casey deals with one challenge after another, all in pursuit of an undefined goal. It’s a wonderful way to handle an adventure story that’s aimed at young people, and for much of the movie it works wonderfully as a ticking clock. Once the purpose of the mystery is exposed, however, the movie becomes more unsettled as it races to the finish. Tomorrowland originated with producer Damon Lindelof, who wrote the story with Jeff Jensen. When Brad Bird joined the project as director, he also took on writing duties with Lindelof, and while it’s difficult to say with any certainty, the movie feels like a lumpy blending of their strengths as writers. Lindelof, co-creator of TV’s Lost, is known for crafting extremely complicated mysteries; Bird, writer and director of the animated The Iron Giant, The Incredibles, and Ratatouille (he also directed the live-action Mission: Impossible – Ghost Protocol), is known for his mature view of nostalgia and partiality for moral lessons. While Tomorrowland benefits from its mysterious scenario, the lead characters — let’s call them Grumpy and Happy to tie in the Disney mystique — fail to make much of an impact upon the story. We’re repeatedly told, for example, that Casey is special, but her intelligence is reduced to a series of hunches, not deductive reasoning. And Frank seems to have become little more than a paranoid, self-serving hermit. Still, Tomorrowland has much to recommend it, especially for younger viewers and their parents, who should have a good time discussing the thematic issues raised. Overall, however it’s a reminder that yesterday’s Tomorrowland pales in comparison with today’s problems. The film opens wide in theaters across Dallas and Ft. Worth on Friday, May 22.